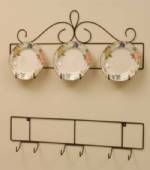 Part of our Contessa Collection, this triple place hanging plate rack is solid metal, features a durable black powder coated finish, and is hand made in the U.S.A. Rack is ideal for 9" to 11" plates and measures 44" high x 6 3/4" wide x 3" deep. 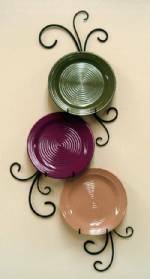 (Plates shown are 10 1/2") The perfect combination of style and affordability! You have so many plate racks, it was hard to decide. But so glad I picked this one. I love that it's made in the US. And my plates look great in it!